This is in response to Donna's (nelli) challenge to post a shot of how each of us enjoys a cup of tea. Even if you're not a tea drinker, why not join in with a context shot of your beverage of choice? Many of you probably already have suitable shots uploaded. All they need is a starter comment to push them out into view. Lovely still life! 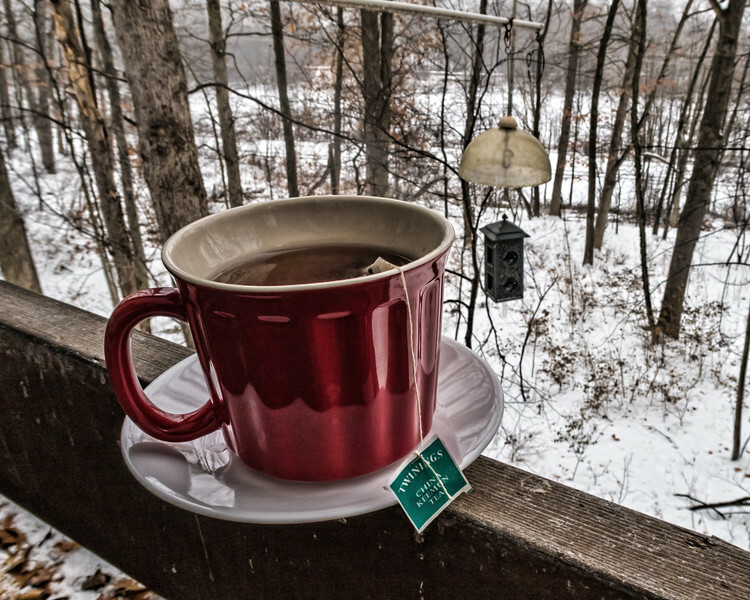 I really like the way you have set this up so that we see the snowy landscape outside the window, which provides a great contrast for the hot cup of tea, which would keep us warm! I don't know how anyone could ever think you lazy with all your amazingly creative collages and creations! Terrific shot and it looks like a tasty beverage! I really like this! Very nice capture and it looks like an excellent hand warmer. Super shot of a warming drink on a cold morning. One awesome looking mug of tea & like you had mentioned, great hand warmer as well!